This super-simple cream pie has rich chocolate flavor with hazelnut tones enhanced with a shot of Frangelico (hazelnut liqueur). Rather than an Oreo crumb crust, you can use a blind-baked paté brisee crust. For a really decadent dessert, top with whipped cream and fresh raspberries. Nutella, chocolate hazelnut spread, has been on the market since 1963 though the actual Ferrero recipe, from Italy, has been around since the 1940s. The American Nutella is hazelnut/cocoa flavored sugar, not a quality product, but still okay for Nutella nuts … enthusiasts. I’m a purist about some things and chocolate hazelnut spread (more of a butter) is one of them. The recipe follows for making your own Nutella. It is very simple and you can adjust the sugar content to personal preference. There is no milk, wheat or other fillers in this recipe, just roasted hazelnuts, cocoa powder and sugar. It’s important to roast the hazelnuts before grinding because any water left in them will produce a mush rather than a butter. Roasting also helps to remove the skins of the nuts. No need to add vegetable oil because the hazelnuts will make their own oil when processed. It’s just like making peanut butter. Hazelnut oil is fragile and will breakdown at room temperature within a couple months so its best to refrigerate as soon as made (will keep up to 6 months refrigerated). You may substitute melted bittersweet or semi-sweet chocolate chips for the cocoa powder. Start with 1/4 cup melted chocolate and add more if needed. 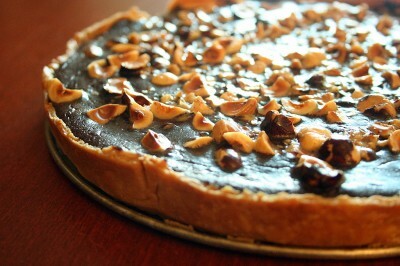 For more information just Google: Freddy Guys Hazelnut Farm of Willamette Valley, Oregon. 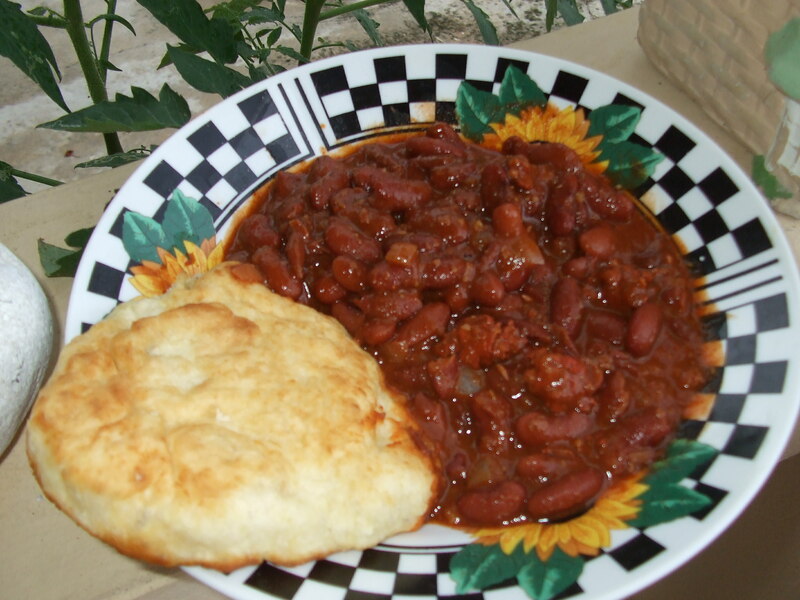 This recipe is adapted from a recipe of Barb Foulke’s, owner of Freddy Guys. In the 1970s there was a terrific diner in the hard-hat area of San Francisco that served grilled calves liver steaks about 3/4 inch thick with gobs of sautéed onions, horseradish sauce and mashed potatoes. I still remember the succulent caramelized flavor on the outside and the moist, tenderness on the inside of that medium-rare liver steak. This was he-man food for construction crews. It definitely wasn’t that shoe-leather that Mom cooked with heavy gravy that could only be masked with lots of French’s mustard. But after all, liver is a good source of protein and iron and easy on the pocketbook so back in the day liver for dinner once or twice a month was not uncommon. Over the years I’ve developed this flash method of sautéing liver and onions with a bit of lemon juice, a splash of Worcestershire sauce and some sage. It’s very similar to the Tuscan and Venetian style of preparing liver. 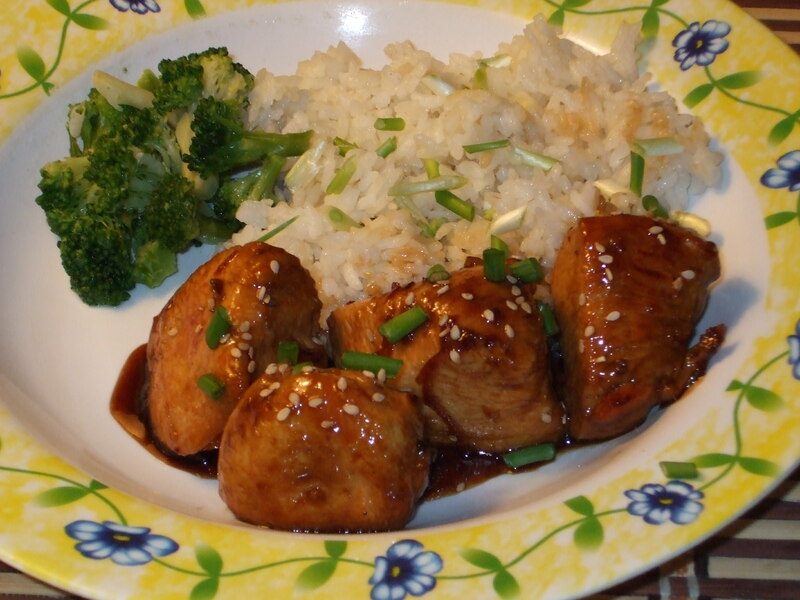 The acid of the lemon removes the gaminess of the liver and the Worcestershire sauce adds a little kick. Served with polenta and garnished with garlic chives this is lighter in calories yet still filling. 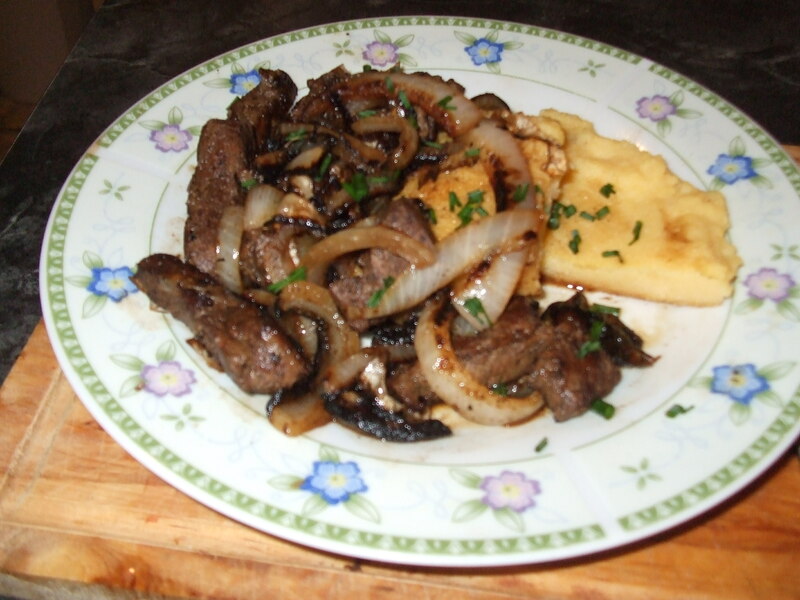 The secret to tender liver is thin slices, flash-fried and rested while the onions sauté and you make polenta. Dinner is ready in 30 minutes easily. This quick and easy pasta sauce is ready in the time it takes to boil the water and cook the pasta to al dente. 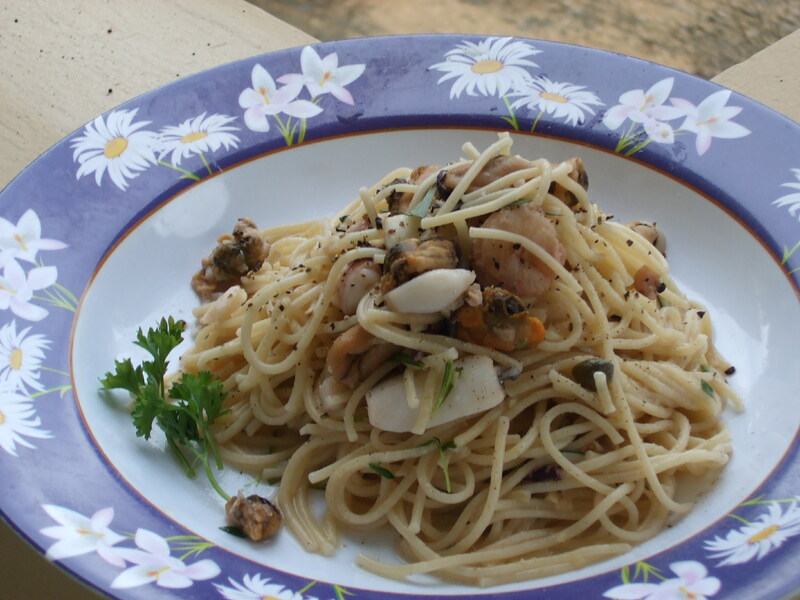 The mix of seafood includes squid, crab, shrimp, mussels and steamer clams. 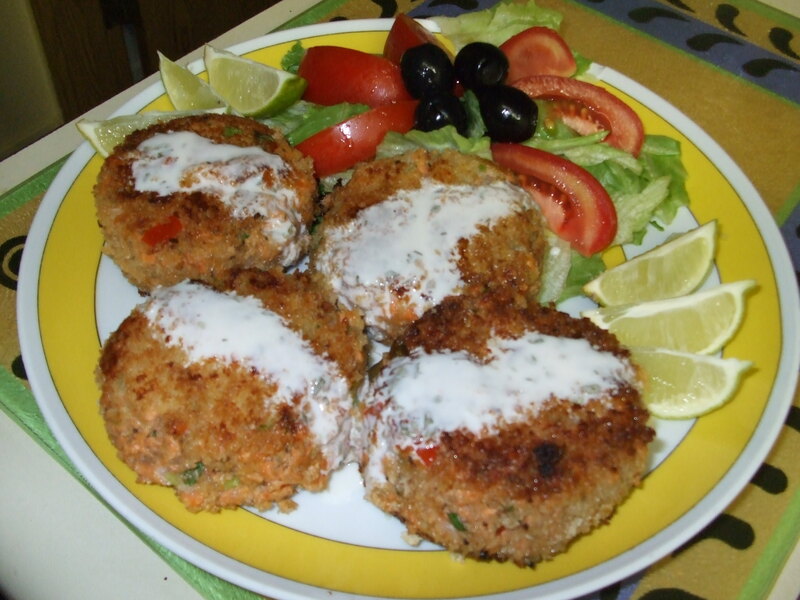 Mixed seafood is available in most supermarket freezers or at your local fish monger. This sauce also works with flaked marlin, swordfish, halibut, or tuna. Get creative and add one of your favorite ingredients… perhaps capers, sweet peas, ramps, mushrooms, or cardoons. 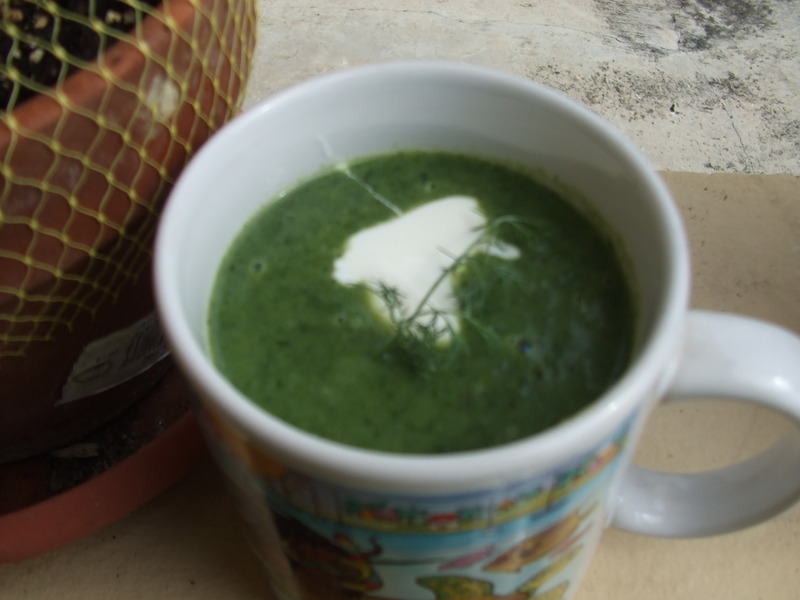 You can’t get much healthier than fresh baby spinach soup with Greek Yogurt laced with plenty of fresh dill. This is pure comfort food and all homemade! Often I grab a mug of some soupy concoction for a quick lunch. It may be tomato soup, chicken noodle or minestrone but always homemade so I know what is in it. Fresh vegetables in season are just the ticket to a quick, delicious and nutritious soup like this spinach soup… loaded with iron and vitamins. A mug lends a little portion control which is my major food challenge. Even healthy food can be fattening if you over-do-it. Spinach was pretty common in our house when I was a kid. The Popeye cartoon series was all the rage then and parents exploited it so we had no choice but to eat it and learn to like it. Mom drizzled a little vinegar on canned spinach to give it a little bright flavor and she made fresh spinach frittatas (quasado) and spinach salads which were full of flavor. Early exposure is the trick to teaching children to eat vegetables. Growing your own vegetables with the kids is another way to develop their taste for vegetables. They’ll love eating what they have helped to grow…back in the day, we certainly did. Baked frittata is magnificent for a crowd but this quick pan-fried frittata, which takes less than 15 minutes to throw together and cook, is perfect for one or two servings as a light dinner with a green salad and glass of wine. Its just a little less than one serving of leftover cooked spaghetti pasta, about 1/2 cup of leftover marinara sauce, leftover mozzarella and Parmesan cheeses plus 2 eggs. The outside is crusty and buttery, and the inside is tender with lots of Italian flavor. Garnish with fresh basil before serving. Blend the leftovers in a bowl with the eggs, don’t forget the cheeses. You shouldn’t need anymore seasoning if the marinara sauce was adequately seasoned when cooked. Use a 10-inch nonstick skillet and melt a tablespoon of butter or more over medium high heat, then pour in the pasta/cheese/egg mixture. Let it cook undisturbed until the eggs set and the bottom is nicely golden brown. The top will look slightly undone, not runny but not totally dry. Slide the whole thing in one piece onto a plate bigger than the skillet. Using hot pads or kitchen towel, invert the skillet over the plate. Then flip the plate over so the frittata lands upside down in the skillet. Return the skillet to the heat and cook 3 minutes more or until the bottom is nicely browned and crusty. 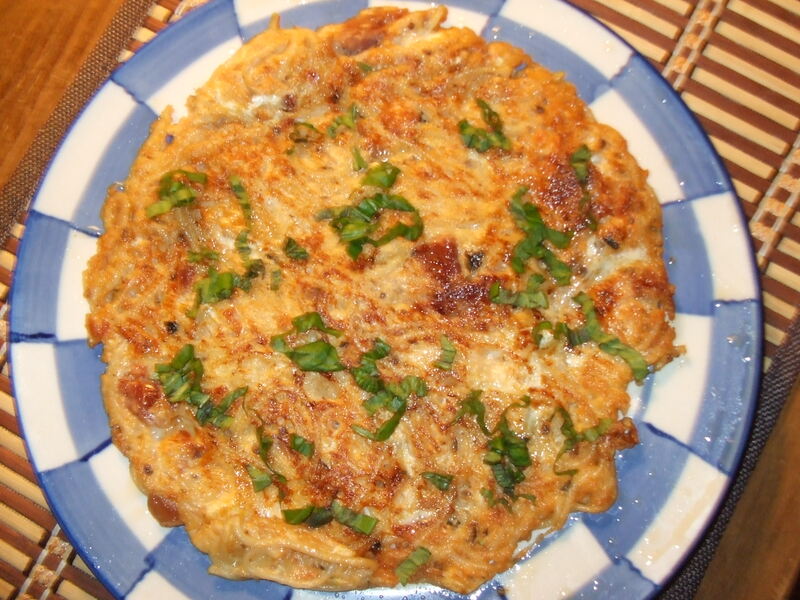 Slide the finished frittata onto the same plate you used for flipping and garnish with fresh basil. Sourdough always makes me think of San Francisco or Anchorage. After all it was the gold prospectors of the early 1900’s who made sourdough a staple of the last frontiers of our nation. Often times the miners kept a ball of sourdough in their pocket so they’d always have the yeast to make a batch of bread or biscuits. Not only is sourdough bread one of my true eating pleasures but growing my own sourdough starter and making other sourdough goodies is right up there on the accomplishment scale. I love sourdough biscuits, pancakes, crepes, pizza crusts, sourdough spice cake and this basic sourdough cookie recipe. 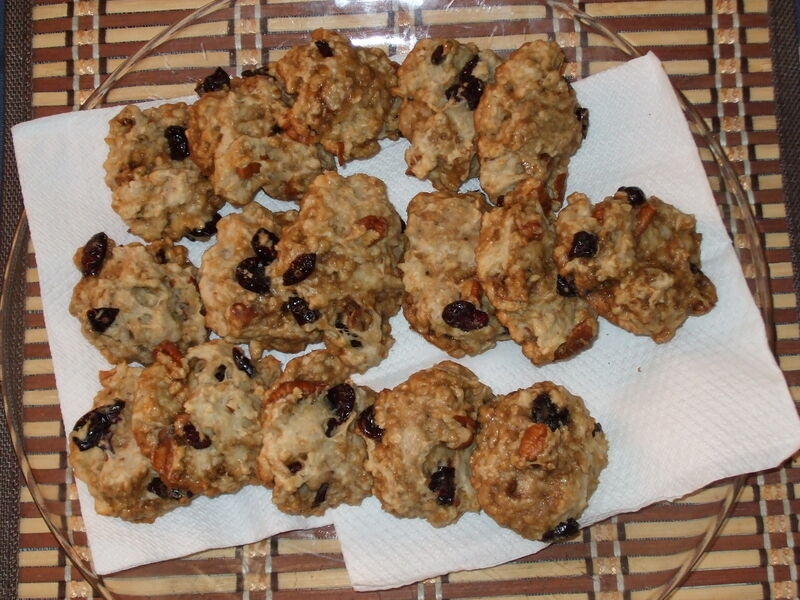 It’s perfect for making oatmeal raisin cookies with crisp outsides and soft insides. There’s just a tad of tang that plays nicely with the blue berry raisins and a hint of brown sugar that caramelizes on the outside. The pecans add a bit of crunch. 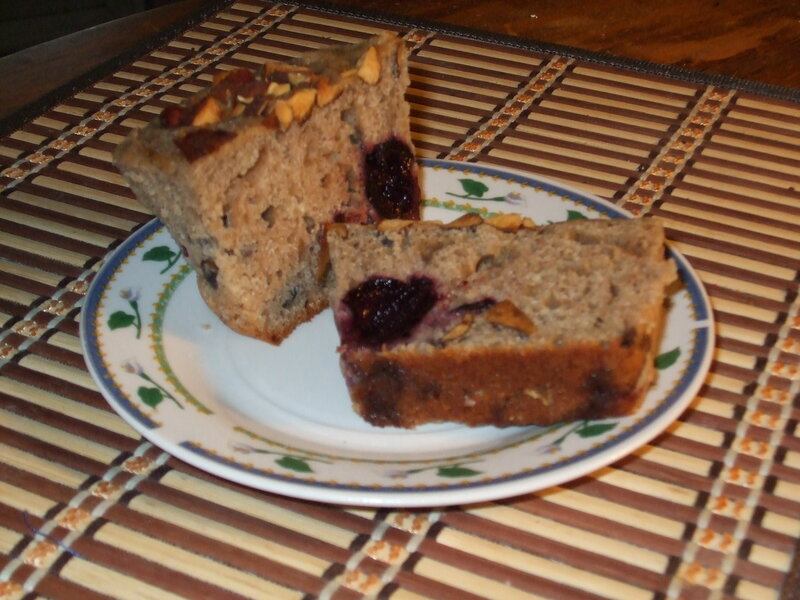 This was a spur-of-the-moment quick bread made with leftover frozen cherries and toasted almonds. It turned out so moist and flavorful with hints of cinnamon and nutmeg along with the crunch of the almonds and sweetness of the cherries. This recipe is adapted from a Hawaiian Mango Bread recipe I picked up a zillion years ago while traveling through Honolulu. Just add chopped mango, coconut and macadamia nuts in place of the cherries and almonds and you’ll have Hawaiian Mango Bread. Actually, you can use any fruit and nut you desire and come up with your own version. Be sure to use the yogurt as it activates the baking soda and baking powder giving you a super light crumb instead of a dense and heavy mass.